Since my last post I’ve been more than a bit busy as we prepare for the grand opening of the Neurological Rehabilitation Center at Sinai Hospital in Baltimore. My imagery is featured exclusively throughout the unit. 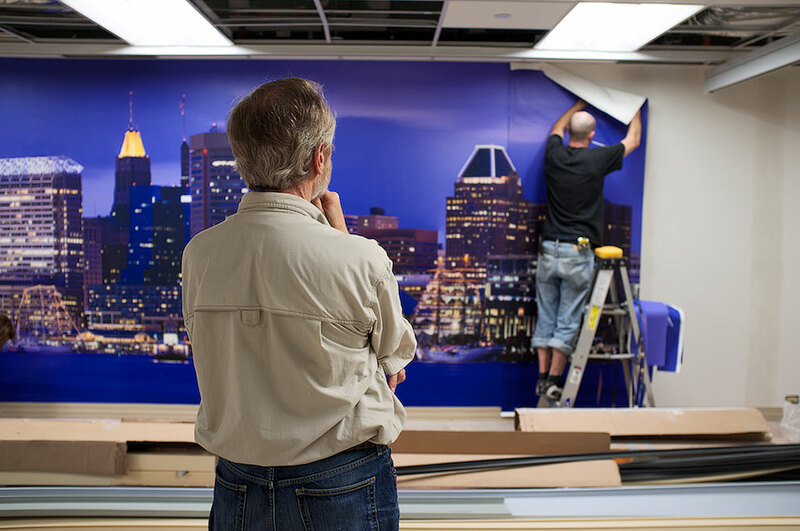 That’s no small matter when we’re talking more than 50 images, some as much as 30 feet in width! About ten days ago my installers put up all the wall covering images. I thought it would be fun to show you the main graphic going up. My assistant, Bob, compressed about two hours of work into a 60-second video that we recorded using my Nikon D800 and Bob’s Nikon D7000, both mounted on tripods. It was a stressful day, with having to hang a 30-feet, 19-feet, 17-feet and assorted 10-feet and 4-feet walls. But our installers are super-pros and did a great job. Hats off to Robin, Sean and Bill! For those of you who are curious, here is the file from which we created the wall covering. In the video you may notice that one of the panels is a bit “off” in terms of color and shading. We ended up having to rush back to our studio late at night, reprint the 9-foot strip, coat it with sealer, and have it back bright and early the next morning for our people to install it. Stuff happens! BTW, I took this pano using three rows of 14 images with my Nikon D800 and a 200-400mm lens set at 300mm. For details on how I shoot these panos, click here and here.